Instruments by LaserpithiumDownloads 253 The counter was reset in 2013 when the web site was moved. Before that the counters showed 3645 hits for this addons. 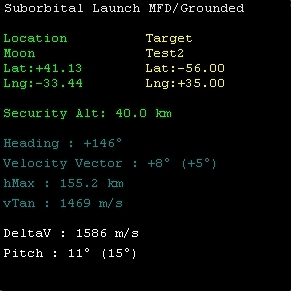 SuborbMFD is an MFD dedicated to perform suborbital flights on celestial bodies without atmosphere (for example, the moon). You choose a target, and SuborbMFD computes for you the most economical trajectory to reach this target. Plan now suborbital flights even without being grounded.